Imagine being able to buy a luxury watch and at the time of purchase you can register it at a secure global registry which will allow you to maintain a historical record of all aspects of your watch, including maintenance records, purchase receipt, warranty and photos. All the watch’s information is at the tip of your fingertips on your smartphone or tablet, accessible anywhere, anytime only by you. In case your watch is lost or stolen, with the press of a button, you can put it on a stolen database which will allow anyone in the world finding the watch, to contact you secretly (without knowing your identity). Users of The Chrono Registry will be able to download a free app from their smartphone provider and register their first watch free of charge. Additional watches may be registered for a one-time charge of €0,99 per watch. If the user wishes to access the Premium services, he can pay the annual €10 fee for the use of these value added services and right to register 5 watches included in this price. In the first stage, value added services include declaring a watch lost or stolen on their worldwide stolen database, thus making it more difficult for a thief to resell the watch and improve chances of recovering the watch. Premium users checking on a serial number, will have the option of contacting with the person that has registered the watch associated to the serial number you are searching. In addition, they will get access to all new services we are developing for the same annual cost. Freemium users searching for a serial number, will receive the results of the search in “Read Only” mode; meaning they will know if the watch has been registered previously, declared stolen or not, etc, but they won’t be able to establish contact with the owner. Focusing on the Watch manufacturers first, The Chrono Registry will reduce the revenue lost by watch Brands due to the increase in counterfeit watches in the market. They can track the history of their watches based on a proprietary tracking algorithms, creating an uninterrupted tracked “life” of a watch. Only authorized Jewellers will be able to sell watches of that brand. 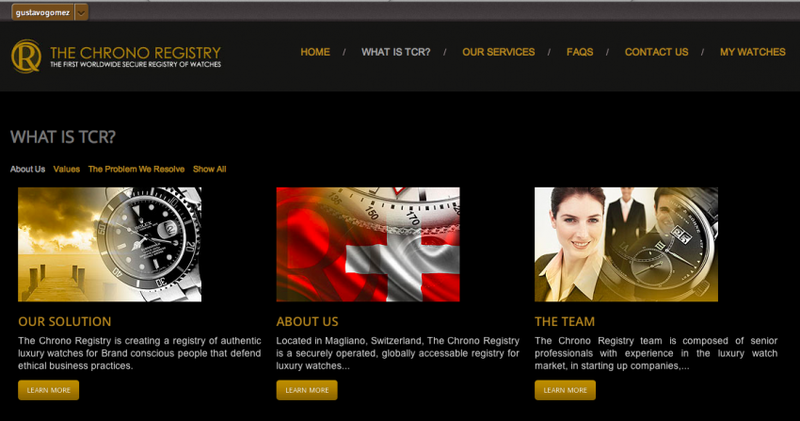 Hence, joining The Chrono Registry, will allow a Brand to transmit to the market its pro-active actions to fight fakes. The Chrono Registry will also provide Brands with real-time alerts as sales are produced as well as market positioning reports in relation to all other Brands as a group. The website is still in beta, but sit tight, the full version should be launched in the next few weeks. A service definitely worth to be checked out by anyone who cares to protect their watch or, more largely, their brand. We just got the confirmation from The Chrono Registry that as of today (November 10, 2013), their iPhone App is up for a grab at the AppStore.